The Isabella County Recycling Center / Material Recovery Center accepts the newspaper, cardboard, office paper, metals, glass, plastic, automotive, yard waste, tires, styrofoam, and books for drop off at the Recycling Center located at 4208 E. River Road in Mt. Pleasant. If you have materials to bring for recycling please read the page associated with the materials you would like to bring to be sure they meet the Acceptable Materials guidelines. If you need assistance please contact the Recycling Center during regular business hours at (989) 773-9631. Recycled cardboard only takes 75% of the energy needed to make new cardboard and lessens the emission of sulfur dioxide that is produced when making pulp from trees. Recycling 1 ton of cardboard saves 9 cubic yards of landfill space and 46 gallons of oil. Examples: Mail, office and school papers, envelopes, sticky notes, and card stock. File folders and note books. Special note: Remove envelope windows. No need to remove tape, staples, or metal spirals. 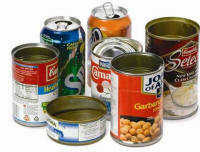 Canned food containers, aluminum beverage cans, aluminum foil and pie plates, aerosol cans. Ferrous and Non-ferrous metals including lawn furniture, hangers, pots and pans, shelving, and wire. Special note: All scrap metal must be dropped off at the Recycling Center. Scrap metal is not recycled curbside or at the depot locations. Most appliances can be recycled (Freon must be removed). Please call prior to drop-off to ensure the item will be accepted. Special note: No need to remove labels, rinse lightly. No plate or window glass, no other colors, no Pyrex®. A recycled glass container can go from a recycling bin to a store shelf in as little as 30 days. Glass can be recycled forever and glass containers are made up of as much as 70% recycled glass. Special note: Throw away caps, lids, pumps, and rings. Rinse lightly and flatten. No need to remove labels. No plastic bags, plastic tub (margarine and yogurt) containers, 5-gallon buckets, or oil/antifreeze bottles. We recycle #1 and #2 plastics only. Polyethylene Terephthalate (PETE #1) and High Density Polyethylene (HDPE #2) are highly recyclable and are made into fleece jackets, food containers, and plastic lumber. 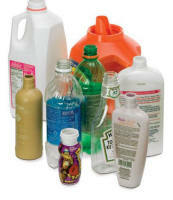 Recycling 1 ton of plastic saves 160 gallons of petroleum. Special note: Items can be recycled at the Recycling Center. Cannot be accepted curbside or at depot locations. Just 1 gallon of motor oil can contaminate 1 million gallons of freshwater. Oil can be reused and recycled through reconditioning, reprocessing, and re-refining. X-mas Trees: 7' or less $3; 7' or more starts to increase by $3. Special note: All yard waste bags must be emptied; take plastic bags with you, brown paper bags may be recycled in the cardboard bin. 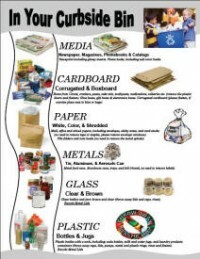 Items can be recycled at the Recycling Center. Cannot be accepted curbside or at depot locations. Yard waste can be composted at home along with food scraps to produce a natural soil amendment. Grasscycling, leaving the clipping on the lawn, reduces the lawn’s water loss and need for fertilizer. Recycled tires can be used to make rubberized asphalt or maintain landscapes through erosion control. Tire stockpiles can contribute to the spread of disease by providing an ideal breeding environment for mosquitoes. Special note: Drop-off item only, cannot be recycled curbside. No packaging peanuts or insulation foam. Styrofoam is the trademark name for plastic #6 polystyrene. Try donating your used books to local organizations or trading them for other books with your friends.